Worry about buying a new TV set to replace the existing Analog TV? The trendy HDMI, DVI or the traditional YPbPr 1080i Output on the External ATSC/QAM TV Box HDMI Edition can transform your Analog TV into a HDTV ready digital ATSC TV! With the purchase of External ATSC/QAM TV Box HDMI Edition, you are not only converting your LCD monitor into a TV, but also, a digital photo frame. External ATSC/QAM TV Box HDMI Edition is equipped with USB Input for MP3 and JPG playback. 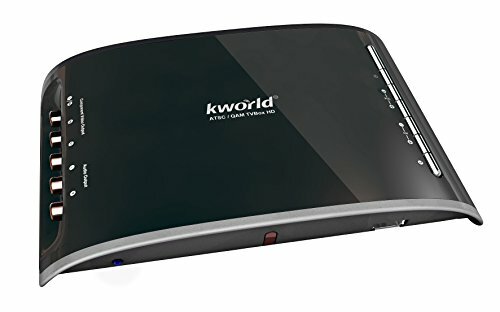 If this TV Box is brought home for entertaining your children, KWorld External ATSC/QAM TV Box HDMI Edition is equipped with Parental Control Function. Now you can lock the inappropriate materials away from the sight of your young ones! The External ATSC/QAM TV Box HDMI Edition not only supports "digital free-to-air vestigial TV", but also unencrypted QAM cable TV. With this device, you not only are able to view your favorite programs in high quality 16:9 aspect ratio with 1080i or 720p video quality, but also on a high definition HDMI monitors or any regular monitors! As an environmentally conscious user, the devices you use must conserve energy. With External ATSC/QAM TV Box HDMI Edition, the Power Smart Function can be handy when you accidentally fall asleep: this function automatically power-off your TV Box when it has been idle for more than 30 minutes/1 hour/2 hours/4 hours. You can watch HD (ATSC/QAM) television using the this devices HDMI, DVI, and VGA ports. Not compatible with FIOS encrypted signal. View More In Analog-to-Digital (DTV) Converters. If you have any questions about this product by KWorld, contact us by completing and submitting the form below. If you are looking for a specif part number, please include it with your message.